Looking for wild exciting times? Visit Edmonton, Alberta’s capital city! 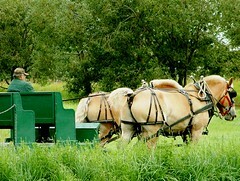 Alberta embraces the simpler life, and some farms (like Sprout Farms) offer wooden wagon rides pulled by draft horses. It’s one way to spend a summer day in Alberta, but the Edmonton area has so much more to offer. Here are some suggestions of things to do, when you travel to Alberta’s capital city, Edmonton.